Biscotti are long and hard cookies that many enjoy by dipping into coffee, hot chocolate, or wine. As fancy coffee shops become more and more popular in the United States, biscotti have also become more fashionable (and expensive). It turns out, biscotti is easy to make, and a whole batch costs the same as a single biscotto at Starbucks. Here's my recipe for an Almond and Orange Zest Biscotti that can be enjoyed as is or chocolate dipped. 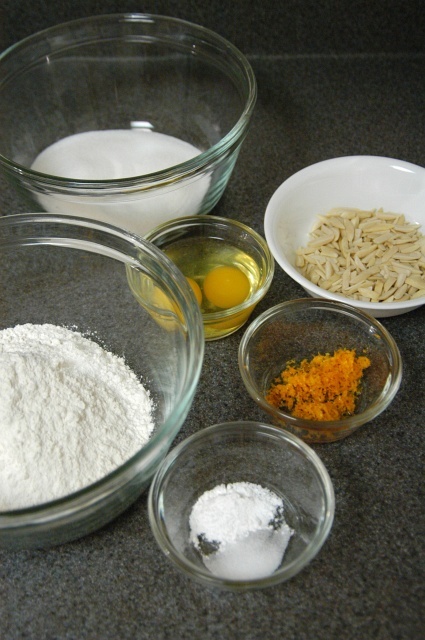 Start by assembling the ingredients: 1 cup (200 g) sugar, 2 large eggs, 3/4 cup (80 g) slivered almonds, 2 tablespoons minced orange zest (about half an orange's zest), 1 teaspoon baking powder, 1/4 teaspoon salt, and 2 cups (250 g) flour. You will also need 1/2 teaspoon (2.5 mL) vanilla extract and 1/4 teaspoon (1.2 mL) almond extract (not shown in photo). 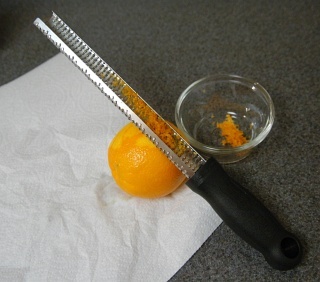 For removing the zest from an orange, I find that when using a Microplane Zester upside down (with the orange under the zester), the zest stays in the device making it much easier to judge how much you've collected. If not using a Microplane (or a zester that produces comparably fine zest), you'll need to mince the zest for this recipe. Preheat the oven to 350°F (175°C). 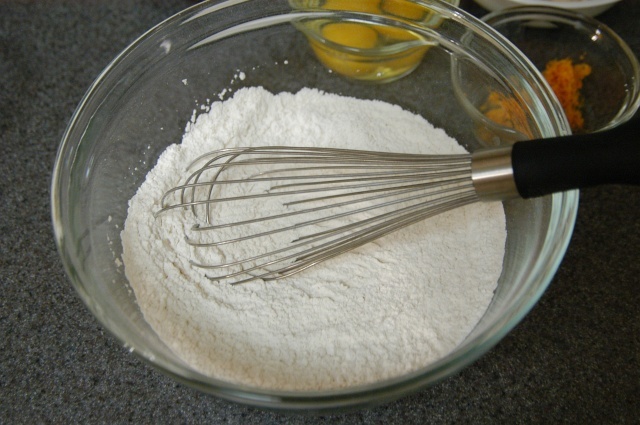 Whisk the flour, baking powder, and salt together. Select a mixing bowl that is large enough to hold all the ingredients and still provide enough room to fold them together without making a mess. Break two large eggs into the large mixing bowl and add the sugar. Whisk to combine. Continue whisking the sugar and eggs until the color has lightened to a pale yellow. I like using a spare piece of mesh cabinet liner to keep the bowl from shifting while I'm whisking. 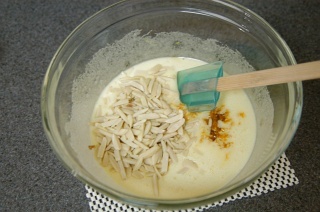 Add the vanilla extract, almond extract, orange zest, and slivered almonds to the egg and sugar mixture. 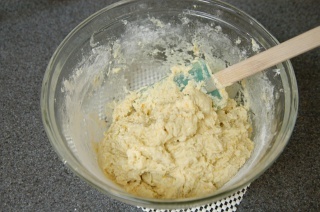 Using a spatula, stir once or twice to combine. 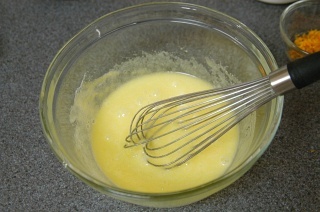 Working in batches, pour enough of the flour mixture to cover the surface of the egg mixture. Use a spatula and fold in the flour using as few strokes as possible. Add more flour and fold until all the flour has been integrated. Folding is performed by using a spatula to scoop from either the side or the middle of the mixture and lifting and "folding" (basically movign the spatula laterally and then flipping it over to drop the mixture) onto another part of the mixture. Rotate the bowl each fold. 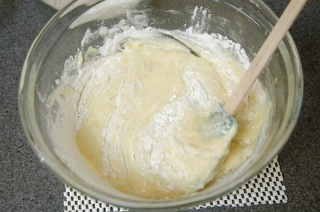 The key is not to stir or mix the flour with the liquid too much. Gently folding helps prevents the formation of too much elastic gluten. The presence of too much gluten will defeat the delicate and crisp texture we are trying to achieve and result in a possibly chewy product. Split the batter in half and place the two rough balls onto a non-stick baking sheet (such as a silicone baking mat or parchment paper set in a half sheet pan). With your hands, form the batter into two loaves of approximately 10-in. (25 cm) by 2 in. (5 cm) each. Wetting your hands just a bit may help with molding the loaves since the batter will be fairly sticky. Remove the loaves from the pan and place them on a wire rack to cool for at least ten minutes. This cooling step is extremely important to your non-dominant hand as it will be holding the loaf while you cut it in the next step. After some cooling, move a loaf to a cutting board and cut diagonally into 3/8-in. (1 cm) thick pieces. Do the same to the other loaf. The interior of each biscotto should still be just a little moist (while the exterior is nice and hard). The crust of the loaf will probably be quite hard, so use a large serrated knife such as a bread knife for this job. Place the biscotti with a cut side facing up on a half sheet pan and bake for 8 minutes. Remove the pan and flip all the biscotti over so the other cut side is now facing up. Bake for another 7 minutes. Set all the pieces on a wire rack to cool making sure that none of the biscotti are touching each other. If the biscotti are placed too close together, they could get a little soft or soggy as they cool. Once the biscotti have fully cooled, they can be consumed as is, or chocolate dipped. 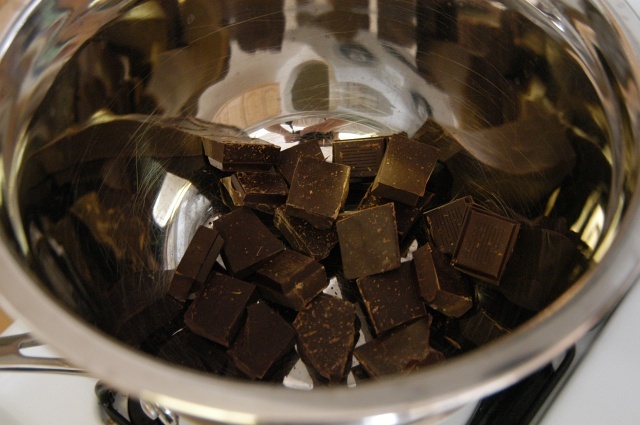 To chocolate dip, simply break up the chocolate of your choice (dark chocolate is Tina's favorite) and place in a large metal mixing bowl. I find it easier to dip biscotti in large quantities of chocolate, so I usually make two batches of biscotti (4 loaves), and melt about 250 g (a bit more than 1/2 pound) chocolate. For one batch, 125 g (about 1/4 pound) chocolate should be enough. Using a flat bottomed mixing bowl also makes it easier to dip (otherwise you may need to transfer the chocolate to another container after melting to dip the biscotti). 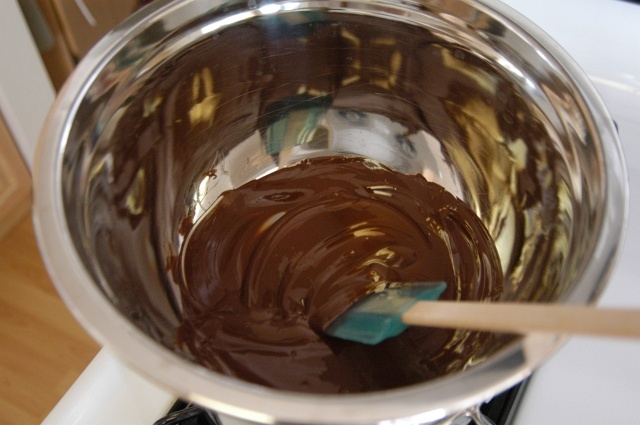 Place the mixing bowl with the chocolate over a saucepan containing about an inch of water (but not so much that the mixing bowl will actually make contact with the water). Bring the water to a boil and then reduce the heat to a simmer. 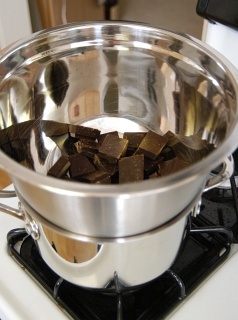 Once the chocolate begins to melt, you can turn off the heat and let the residual heat and steam continue to heat the bowl and melt the chocolate. Stir occassionally to check when the chocolate has completely melted. Once the chocolate has melted, you can leave the mixing bowl over the hot water to keep the chocolate warm and melted as you dip the biscotti. Dip each biscotto in the chocolate by inserting the flat bottom into the chocolate. Use a spatula to remove any excess chocolate and then lay the biscotto (chocolate side down) on a silicone mat or sheet of parchment paper. Repeat until all the biscotti have been dipped. 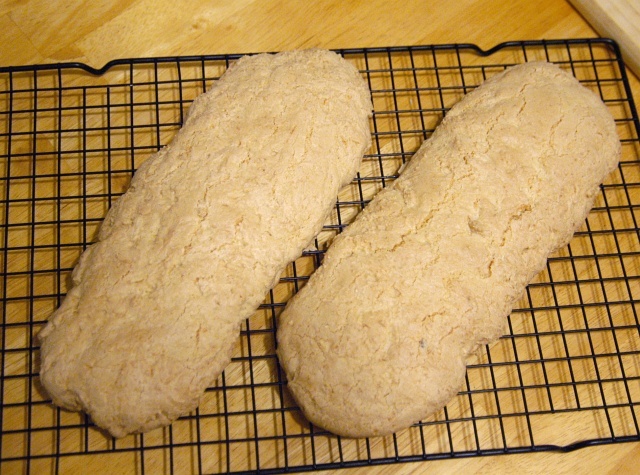 The biscotti can then be left to cool on its own or placed in the refrigerator. The biscotti tastes best during the first few days, but will keep for up to a month in a sealed air-tight container. 1 cup (200 g) sugar whisk until light yellow stir in gently fold in form into two loaves bake 350°F (175°C) 40 min. rotating once cool on wire rack and cut into 1 cm strips bake 350°F (175°C) 8 min. flip biscotti bake 350°F (175°C) 7 min. Your site is out of///..... site/sight. I want the biscoti, I want the beer can turkey, I want it all. Perfect bro.... forget the inlarged prostate and the kate bush collection, your a dude... dude. Live it up up and like it rude. Love you baby. You knows it bro. Welcome. Wales. Pleaaaaaaaaase, Pleeeeeeeeeeeeaasee me baby. Love. There is a bit of confusion with the quantity of chocolate specified in the recipe. 500g is a bit more than a pound, not 1/2 pound, so which is correct metric or standard? So, I was wondering, do you think these will work well without the almonds? Or failing that, is there an alternative you could suggest? Thanks! whether 500gms or 1lbs(good for 2 batches of biscotti), 250gms or 1/2lbs(single recipe biscotti), is irrelevant to this recipe as it's only used for dipping. depending on the chocolate's viscosity and the hand that dips, more or less chocolate can be used. the weight given here is just a guideline in approximating. you can use other chopped nuts like filberts/hazelnuts, cashews, macadamia, or even dried fruits. others often pair macadamias with white chocolate. but i'm a strict follower of the dark variety. preferably 65% cacao. I've read that melted chocolate should be tempered in order to resolidify correctly. Does it matter when you are using it for dipping? chocolate biscotti require a slight re-engineering of the recipe, (or find an chocolate recipe to start) and make it special with the addition of 1 teaspoon of cayenne pepper per 1.5 cups of flour. (some recipes are larger/smaller, 1 teaspoon per 1.5 cups of flour is a good ratio. it make them picant. Thank you, thank you, thank you, for using biscotto correctly in a sentence. As a person who cares about grammar and knows rudimentary Italian, I cannot stand asking for a single "biscotti" at the cafe. But they always look confused when I ask for a biscotto. And then I feel like such a pedant explaining it. But to ask for "one biscotti, please" makes my skin crawl. Yes, it would be cheaper to bake a batch of them, but then I'd eat the batch. Not good. This is without a doubt the best biscotti I have ever made! I made two minor changes. I doubled up on the Vanilla extract, and eliminated the almond extract and I used walnuts instead of almonds. It was a hit at a family party! I don't tempering the chocolate is necessary in this case-- tempering chocolate, as I understand it, is mainly relevant when the chocolate will be standing on its own. I usually encounter this issue when baking cookies or other goodies that have chocolate kisses. Kisses are perfectly tempered in the bag, but once they've melted inside a cookie (or one of the Surreal Gourmet's "Chocolate Kiss Wontons"), the kiss usually re-solidifies but doesn't have the same hardness as before. I'm speaking only of the milk chocolate ones, because I haven't cooked with different varieties. The chocolate will resolidify without a problem, but, without tempering, the chocolate won't be as hard or nice looking. Generally, for something like biscotti, I don't bother (since it gets consumed in a relatively short period of time). Not tempering the chocolate does not affect the taste, but it can affect how shiny the chocolate looks and how quickly it develops bloom. If you're serving the biscotti in a warm environment, you may want to temper the chocolate. I'll put tempering on my list of articles to write. Biscotti doesn't mean twice baked in Italian, it the plural of cookie (biscotto). The twice baked thing is one of those rumors that tend to get spread around, who knows where it originally came from. I notice in your recipe you have a caution about over activating the gluten in the wheat flour. I noticed you had a brief description of wheat flour and the gluten in it - I'm wondering if you have ever considered attempting to cook gluten free (besides the occasional flourless cake). You see, a little over a year ago, I had to go to a gluten free diet. I used to bake quite a bit; only recently after finding a few authors dedicated to the subject have I rediscovered baking. Putting aside the inconvenience and cost of cooking gluten free, there are some benefits - besides my health and well being - such as learning a bit more about the chemistry of cooking, and having some recipes where gluten is a negative turn out far better. Apologies for the length. My question is, have you or will you ever consider attempting gluten free cooking? There is approximately 1 in 150 (possibly more and including myself of course) people who would be very interested if you did. 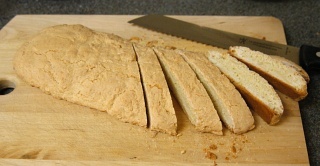 How about eggless biscotti? Possible? My fiance has an egg alergy and cannot tolerate even a little of it :(. For those with an egg allergy, try using soy flour in place of the egg. I think it's about 1 TB per egg plus 1 TB water. You can find soy flour in the local health food store. Good luck! I made the cookies last weekend. I loved them, although I found that they got harder faster than other cookies I've made. I gave many of them to my family and they found it similar to madel bread. I looked up a few recipies for that and they seemed to user oil, which this recipie interestingly doesn't call for. I imagine that would keep them moister. Something to try later. I wanted to mention that the picture directions at the top of the article don't explain when to add the zest. You have to look to the picture portion to see when to add them. You might want to fix that. I have made these twice and am making these again now for my mother, they are wonderful. I grind up the almonds and add them ground to the mixture, I increased almonds to 1 cup, they are just yummy. I also have added in Cardomon, which is one of my favorite flavors. I used self-raising flour (only had that - time to go shopping) instead of the flour, baking powder and salt, added anise powder instead of orange, and halved the size, and it still worked out. Thanks! One thing to remember with cookies is that they will still cook when you take them out of the oven, so don't try to bake them well (especially important to get moist choc chips cookies). 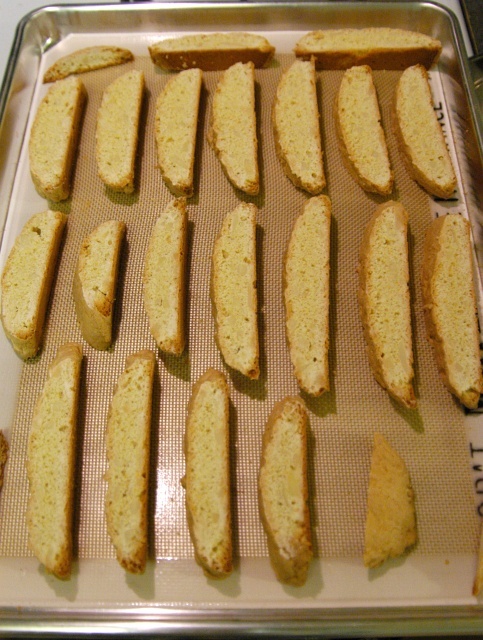 However, biscotti seem to want to be dry, as they are better dipped than eaten on their own. By not adding oil/butter, this is a better recipe. Otherwise, you might get some oily surface when you dip them in coffee. Thanks for the great biscotti recipe. I noticed that the amounts of vanilla and almond extract were not listed in the recipe exept for in the graph at the end. I was glad to see the options you put in with the comments, as, even with favorite recipes, I like a little variety sometimes. I am an expert biscotti maker and I shudder at this recipe. :( It is definately "americanized". This recipe doesn't include the real secret to delicious biscotti. Biscotti is taken after a meal, the anise is meant to settle the tummy. Since anise and chocolate don't go, biscotti should not be dipped in chocolate whatsoever. Ever. Nuts are always good, but as you point out, optional. My question is where's the butter? I almost put my recipe here, but I couldn't bear to let the secret out. I do have to compliment your "loafs" though. 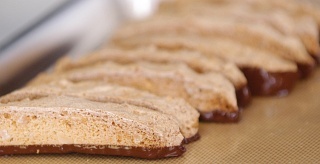 Please forgive the length of this message: In response to the person who wrote that he/she is an �expert biscotti maker�: while traditional biscotti does not have chocolate added to it, one can certainly be flexible and prepare it the way one pleases; with or without chocolate. In fact, I have sent several varieties to friends in Italy, and they love those with chocolate! I have always admired the flexibility shown by Italians� And, in Italy, biscotti are also enjoyed in the late-afternoon dipped in wine. To the person �who cares about grammar�: when one is speaking the language, of course, it�s important to use a word properly. However, in most languages, words �imported� from other languages tend to get slightly corrupted. And, if one wants to be consistent with the correct singular/plural usage, then we should write/say �Biscotto recipe�; �biscotto maker�, etc. In Italy, any type of hard cookie is referred to as �Biscotti� (Biscotto�! ), while here and in other countries, we have come to regard �biscotti� as being only those cookies that are shaped, baked and then dried-out in the oven, as in the recipe above. (I found this definition on-line: Italian, from Medieval Latin bis coctus, twice cooked; see biscuit. But, as happens in language, the word is used today to describe a cookie.) So, let�s all relax, bake our biscotti � with or without chocolate! � and enjoy it whether we refer to it as �biscotto� or �biscotti�!!! Thank you for a very interesting site! Since when does Starbucks have anything to do with quality of baked goods? Puleeeeze. They can't even do muffins, let alone biscotti. Chocolate dipping is fine. As long as it's good chocolate. Btw, anise and chocolate go together extremely well in mole sauce. Now there's an idea... a chipotle pumpkin biscotti in dipped bittersweet chocolate with sesame seeds... hmmm. I wanted to say thank you for the recipe for Biscotti. My husband is on a gluten free diet due to celiac disease, so I am always looking for new ways to do things. I made a few substitutions on the recipe such as instead of regular wheat flour I used a baking mix for gluten free diets. The mix I use has ground almonds in it so no need to add additional almonds unless your into a much nuttier taste. I also do not dip my Biscotti in chocolate as I use the Biscotto bisquits as a base in other recipes such as ground up and used in place of graham cracker in cheese cake crusts. The possibilities are endless. Preheat oven to 350� F. Spread almonds on a baking sheet and toast them in oven until lightly golden. Let cool. Coarsely chop half the nuts. any problem substituting all purpose unbleached flour in this terrific recipe? AP unbleached should work fine. I stand my sliced biscotti on their flat bottoms when they go into the oven to get dried out. This saves the step of having to pull them out and flip them all over and stick them back in the oven. Plus they take up less space that way too! Thanks for an awesome website! You have to remember to sift the flour before measuring. Michael's said this in a couple previous articles - if you don't sift and you use the volumetric measurement, then you'll end up using a random quantity of flour (but always more than he specifies). Or, just get yourself a scale and use his mass values. I'm an American dude, ex 82nd Airborne paratrooper/journalist, living n Italy since 1982. The guy who set up this site has very efficiently and correctly advised us all on how to bake biscotti (plural for biscotto / cookies). He is also correct to suggest that "chocolate" dipped biscotti are acceptable in Italy and highly appreciated by most Italians who "like" chocolate. There is NOTHING American about chocolate-dipped biscotti. Further, let's give the guy (site man) a break and spare him details of "our" individual ailments, handicaps, diseases etc. "Site Man" should not be wasting his time "pimping biscotti" to meet AMA or CDC guidelines...god help him. Having said that is anyone interested in my specialty of "celery biscotti" with 1000 Island dip ? Now that's AMERICANIZED ! I haven't tried your recipe, but I've been adding 2 to 3 tablespoons of softened butter in my biscotti recipe and it came out crispier and lighter. Give it a try. My recipe also called for 4 eggs and that may have made it a bit messier in handling the dough, but you can refrigerate the dough for about half an hour so that it is easier to shape the dough. I use anise extract and also dipped or drizzle with melted chocolate. Never failed in pleasing everyone. I have a question. I keep trying to add cocoa to this recipe but I get an extremely dry dough, even if I remove an equal amount of flour. Does cocoa have some super-absorbant qualities that I'm not aware of? Why doesn't this work?? For people who are interested, try adding a 3rd egg when you use 1 3/4 cup flour and 1/4 cup cocoa. It still is very tasty and has the sticky texture of the dough pictured. I've been making biscottum for lots of years and I do two things that might shock you. 1) I use my Kitchenaid mixer, the paddle blade on super low. The good thing about this is that it allows you to compute the consistency very accurately from batch to batch. and 2) I re bake my cut cookies, cooki(?) on a rack so the heat dries out both sides at once. Despite this sacrilidge, I can attest that I have NEVER had a complaint from an end user. And wht's this about storing them for a month? If yours ain't gone in 3 days, you are doing something wrong. I will try this. I am looking for the ultimate recipee though ; Semifredi's from the Bay Area, the best biscotti there is. I have been researching recipes for giving as Christmas presents, and just wanted to say how much I have enjoyed the website. The style of directions given offer a lot of tips that I would have missed going with another recipe (like not over mixing). Having never made biscotti before you have made this very easy for a beginner to make. I also found the posted responses interesting and enjoyable. Each time I bake the biscotti, the log seems to slightly crack on the top. After cooling, they seem to break apart. What am I doing wrong? I can't seem to get clean slices. I am using a good quality knife. Help ! I have been giving biscotti as Christmas presents for years. Most of my recipes come from Cooking Light magazine (cookinglight.com). They have 5 pages of recipes. I composing a new recipe myself for this season: spumoni. I have an ambition to learn to cook at least one kind of biscotto perfectly this year. This site will help--thank you. Are you sifting the flour 1st? If so good. Make sure to not only use a good knife, but a good serrated knife, like a bread knife. Are you baking in a cold room or elevation? Sometimes moving baked goods from a hot oven to a cold room can make them crack. If you are still having this problem, try placing a light dish towel over your loaves when you put them on the wire reack to cool for the 10 minutes before cutting. This should help to lessen chances of cracking. Also don't wait too long before cutting. Hope this helps! I've been making biscotti cookies for my son , but they seem to get too hard after they cool. I would llike them to be a little softer and not too dry> I'm I putting too much sugar or too much flour? I have a recepie that calls for 1 cup of regular sugar and 1 cupo of brown sugar and only 3 tbls of butter. Should I add 1 stick of butter to make it softer? I added some Galliano instead of the almond extract. I return the cut biscotti to the oven on a wire rack placed on the cookie sheet. This allows the heat to surround the biscotti and make it crispier. For those looking for a sugar substitute in their recipes , Stevia is Excellent. It is a naturally occurring sweetener that comes from a root. Stevia is excellent for diabetics, contains absolutely no chemicals, and can be found in most health food stores. I hope it works out. im not sure if im doing it right but there's a eggy smell and taste. what is going wrong? 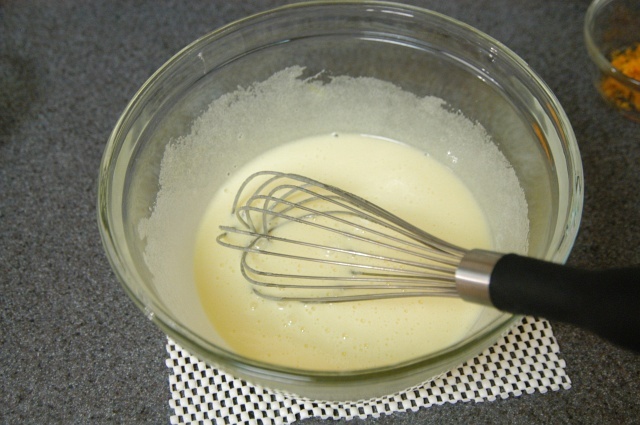 shld i whisk my egg and sugar longer? I use an electric knife to cut my biscotti. Using an electric knife allows you to cut the loaves immediately, no need to cool down. Also, can't wait to try the suggestion about lining the biscotti up on their bottoms, for the second baking. Sounds like a great tip! When serving (Army) in Italy for 3 years 1962-65, I lived off base and learned Italian and their cooking. The history of biscotti goes back to the roman army days of long marches. The cooks deliberaly did not put any butter, or grease intro these biscotti so the soldiers could put them in their small packs and eat them along the way without any fear of them getting rancid. We keep ours in a biscotti jar for weeks! Buon appetito! Wow, this recipe is well-organized! Good work. I loved it! The visuals were great for those who have trouble visualizing what the recipe consists of. Subject: my biscottis are hard rock? What texture should the biscotti be? i followed the receipe, and the bisocttis are like a hard rock? is that normal? how can i improve it? Subject: Re: my biscottis are hard rock? Biscotti is pretty hard - they have to hold up to dipping in hot liquid while being eaten. Take your biscotti and dip it into the beverage of your choice - coffee, hot chocolate, tea, milk, whatever suits your fancy - for one second, then take a bite. After reading everyones posts thought I woild clear up some things here on Italian Biscotti!!!! The biscotti came out really well. The only comment I would give would be to remove the smaller parts from the 2nd and 3rd baking process because they would become too hard if baked longer than this. Thanks so much for such a wonderful recipe! Thank you for your recipe. Your pictures alone answered many questions and your hints gave me a jump start to making biscotti. I will get busy now. All the comments and no one questioned the size of the loaves ? I'll give you that they look about 10 inches long, but by 2 inches no way- the width looks at least 4-5 " long and this is supposed to be for engineers- ha ha! yup. but engineers read the directions. 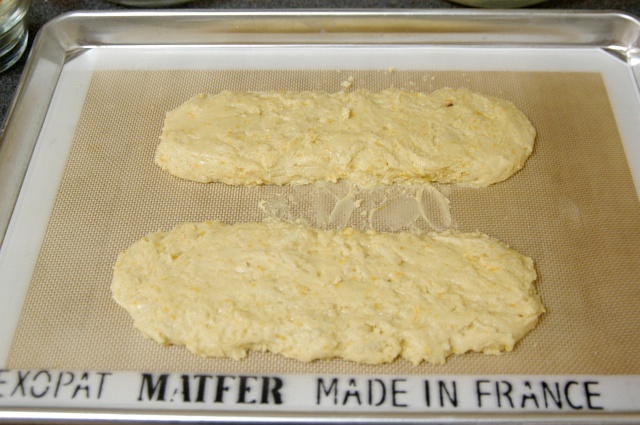 With your hands, form the batter into two loaves of approximately 10-in. (25 cm) by 2 in. (5 cm) each. engineers who bake know formed loaves change dimensions in the baking process. Thank you none the less. Will bake this over the weekend. Great recipe! I wish I saw this before I made my very first batch. Easy directions. My favorite thing besides the pictures is the recipe at the botton - dig that layout! Here is a suggestion for the second baking which was handed down to me by a very kind Portuguese woman. Instead of turning the individual pieces or trying to stand them up on end evenly spaced, after slicing them, leave them on their sides and put whole wire cooling rack into the oven to finish the second baking. The heat and air can bake both sides at the same time. I was very happy Elsie shared one of her baking tricks with me saving me time and effort. I've made biscotti using this recipe (omitting the orange zest and adding a splash more almond extract) a few times now, and they always turn out perfect. Thanks! How do I get a soft, chewy biscotti. bought some at a show recently and they were wonderful. The answer, Don, is that you don't. I think you're looking for a shortbread cookie recipe. Nice recipe and clear instructions, but the list of ingredients at the top of the page does not include the almond and vanilla extracts, although they are included in the diagram. Nice recipe and clear instructions, but the list of ingredients at the top of the page does not include the almond and vanilla extract, although they are included in the diagram. Thanks. I've fixed the article to include the extracts. I've got a batch of biscotti in the oven as I write. For the first time, I decided to weigh the sifted flour. But I didn't get the 250 grams you list; I got 225 -- so I added a little more flour till it reached 250g. I know people measure flour in different ways. I gently fill the measuring cup tablespoon by tablespoon and level with knife. I know some people scoop with the measuring cup and then level. The way I do it may be why I end up with less flour. Since I'm making your recipe, it would help to know how you measure flour. Are you sure they weren't Napolitane? They are formed into the same shape loaf and sliced the same way, but they are cakier and aren't baked the second time. They usually have glaceed cherries in them. Now that's a recipe I've been hunting for for ages! Anyone know how to make them??? Biscotti are meant to be crisp and firm since they're meant for dipping in liquids. Softer or cakier, and they wouldn't hold up. The English word "biscuit" and the Italian word "biscotto" are both derived from Latin: "pan bis coctus" meaning twice baked bread. Simply typing "twice-baked" in Google translate yields "biscotti". Gently score the top edge before baking with a knife coated in butter. What causes the logs to crack? The dough did not feel dry, in fact was just a little sticky. Really like the pictures of your Biscotti Recipe however as an old 93 year full-blooded Italian who married a full blooded Italian, I hate to put a damper on your definition of Biscotti---actually translated it means : "cookies" and it can be any kind of cookies, so when you name them it would be best to say what they really are. I make the Anise Biscotti Logs and have been doing so for the past 83 years. Just 10 years old when my mother first taught me how to make them. Of course there are many biscotti -- Macaroons, Cannoli, Baci di Dama, Pignoli Cenci just to name a few.